Is bigger better? 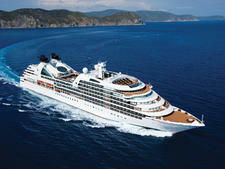 That question is top of mind for many Seabourn Ovation passengers. 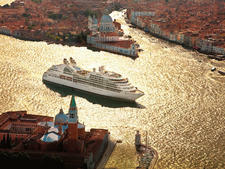 The 600-passenger ship is the second in the luxury line's newest ship class, which started with Seabourn Encore in 2016. 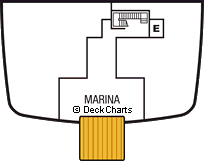 The two are each one deck and 150 passengers larger than the line's older and beloved trio of ships. 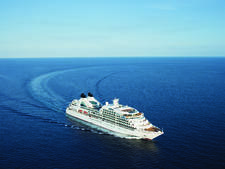 While the larger ships are not so different physically from their slightly smaller sisters, the size might feel a tad big to past Seabourn cruisers, used to the smaller trio, who clamor for the brand's ultra-pampering service and top-notch dining in a laid-back, country club-style environment. In many ways, Ovation's size is an asset. It offers an additional dining option, a sushi restaurant first introduced on Encore, as well as a spacious venue for The Grill by Thomas Keller (which feels cramped on the smaller vessels). It also was the first to debut Seabourn's new alfresco dining concept -- Earth & Ocean at The Patio -- as well as the line's new gelato program. At mealtime, there's something for everyone. You can eat at The Restaurant every night and never be bored, or try a different venue for five nights without repeat (six, if you count in-suite dining). While there were a few minor hiccups, food was generally well executed, interesting and delicious. The ship is gorgeous, thanks to the design inspiration of renowned interior designer Adam D. Tihany, with the help of ArtLink, the art provisioning service for the hospitality industry that curated the art collection onboard. (Though Ovation is laid out identically to Encore, it has its own look.) It also possesses a large number of seating nooks, both inside and out, for passengers to relax with a drink, a book or for a chat. You rarely feel the presence of those 600 travelers -- with the exception of The Colonnade buffet at peak hours. Additionally, the ship is the only one in the fleet equipped with all-new high-speed internet technology. When we were online, we never had that sluggish, waiting-forever-for-the-page-to-load frustration (though occasionally we had trouble getting any access at all, which was likely due to the ship's positioning relative to its satellite). And the vibe still feels like a small ship. Passengers find their go-to bar or evening routine, and you'll recognize the folks you consistently see in The Club, the gym or the casino. Folks are happy to socialize and engage with their shipmates. The ship quickly becomes your ship, with the comfortable feeling of home where people take care of you, rather than the big-ship feeling of being among strangers and valued only for your potential to spend more money. The one place where size seems to have an impact is with service. Ovation strives for Seabourn's high service standards -- crew members know your name before you've met them and are generally warm and friendly, special requests are encouraged and accommodated as best the ship is able and you're never far from a drink. Officers and entertainment staff routinely host dining tables, taking care of solo travelers and bringing passengers together in a way that increases the camaraderie of the ship. However, on our cruise, there were more service hiccups than passengers might expect, given Seabourn's reputation for flawless, intuitive service. Waiters didn't materialize immediately to take a drink order, and we often found ourselves trying to flag someone down, in either the Colonnade or a bar. Orders were misheard in The Restaurant, hot water for tea came lukewarm multiple times and dress code infractions were handled inconsistently and without empathy. Other passengers grumbled about mishandled anniversaries and difficulties with shoreside arrangements. The hotel director chalked it up to new crew needing a few more months to gel, but passengers we spoke to wondered if Seabourn couldn't keep up the quality of service they're used to on the larger ship. That said, everyone agreed that the quibbles were minor, without a major impact on the enjoyment of their vacation. Overall, the ship offers an effortless vacation experience, in which crew members go above and beyond to pamper passengers and make them feel at home. Whether it's too big, too small or just right is a matter of personal preference and the ability not to sweat the small stuff in the face of incredible destinations and a truly gorgeous, luxurious ship. The line is also gay-friendly, and special LGBT meet-ups are held throughout each cruise. You'll hardly see kids onboard during the school year, but during holidays and summers when families or multigenerational groups are onboard, Seabourn offers a kids' program. Cruise Critic’s professional photographers and our extraordinary community members have taken 901 pictures of Seabourn Ovation. When you visit our photo galleries, you can be assured that what you see is what you get. Seabourn's dress code is slightly more relaxed than other luxury cruise lines. During the day, passengers wear casual, resort-style attire (shorts and jeans are allowed) throughout the ship, including in the lounges. Swimwear, cover-ups and exercise attire are reserved for the pool area, outside decks, spa and fitness center. At night, the dress code in all venues is mainly elegant casual -- men are encouraged to wear slacks with a collared dress shirt or sweater (jackets are optional), while women can wear slacks or a skirt with a blouse, a pantsuit or dress. Both men and women are allowed to wear jeans, as long as they're not distressed, in all venues except The Restaurant. On our cruise, we saw the full spectrum of womenswear, from chic outfits with jeans and dressy tops to flowy separates and dresses, both stylish and more casual. Formal nights, which are celebrated only in The Restaurant, occur once on cruises up to 13 days, twice on cruises of 14 to 20 days and three times on cruises of 21 or more days. All other venues aside from The Restaurant maintain elegant casual dress codes on formal nights. Seabourn's formalwear requirements include a tuxedo, suit or slacks and a jacket for men and an evening gown or other formal apparel for women. While the evening dress code is supposedly enforced at 6 p.m., no one condemns you if you're still watching sail-away after 6 in the clothes you wore all day. However, try to enter The Restaurant in the wrong attire, and you will be sent away to change. We even heard of someone being turned away for wearing too casual shoes -- despite shoes not being addressed in Seabourn's official dress code descriptions. 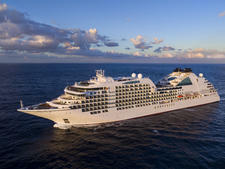 The cruise fare on Seabourn Ovation includes all meals (there are no supplements for any of the restaurants); most alcoholic beverages (beer, wine and cocktails); specialty coffees; a logo tote bag for every passenger; self-serve laundry facilities, complete with detergent; and shuttle buses in port when the town center isn't nearby. Gratuities also are included in the cruise fare, though you're able to tip extra if you wish. (We recommend making a donation to the crew fund in lieu of tipping individuals.) In the spa and on guided tours, tipping is up to the individual.